Fig. 3-2-3-2 shows the number of new inmates associated with Boryokudan (refers to regular members and quasi-members of designated Boryokudan, etc. as identified under the Anti-Boryokudan Act at the time of the offense; hereinafter the same in this subsection) over the last 30 years. The number was 2,960 in 2009, accounting for 10.5% of the total number of new inmates. By their status in Boryokudan, 928 were group leaders, 1,745 regular members, and 287 of unknown status (Source: Annual Report of Statistics on Correction). With respect to the percent distribution of new inmates associated with Boryokudan in 2009 by their age group, those aged 30-39 were the highest in proportion at 33.7%, followed by 40-49 at 30.8%, 20-29 at 14.5%, 50-59 at 12.1%, and 60 or older at 8.7% (Source: Annual Report of Statistics on Correction). Fig. 3-2-3-3 shows the percent distribution of new inmates associated with and not associated with Boryokudan in 2009 by type of offense. The proportions of Stimulants Control Act violations, injury, and extortion were high while that of theft was considerably low with regard to those associated with Boryokudan when compared to those not associated with them. 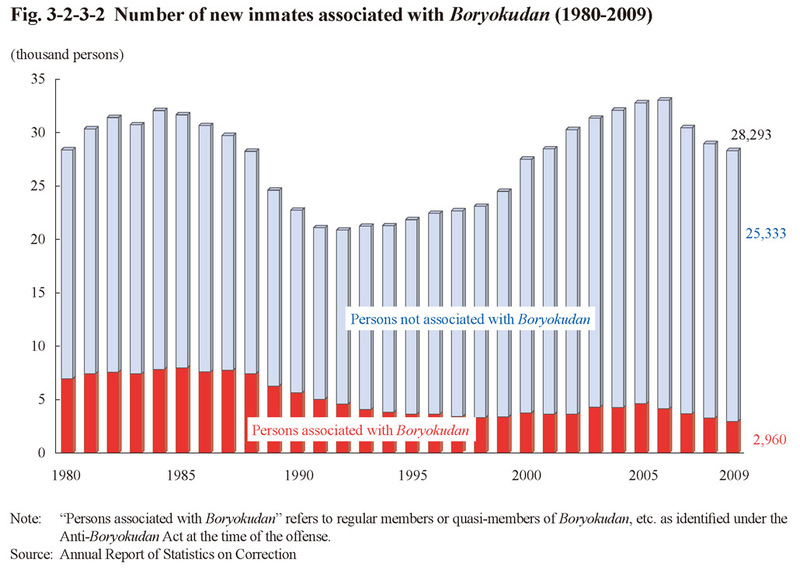 With respect to the term of imprisonment of new inmates associated with Boryokudan in 2009, those sentenced to imprisonment for “over one year but no more than two years” were the highest in proportion at 36.9%, followed by “over two years but no more than three years” at 26.4%, “over three years but no more than five years” at 14.4%, “over six months but no more than one year” at 13.3%, over five years (including life imprisonment) at 7.3%, and no more than six months at 1.8%. The proportion of those sentenced to imprisonment for over two years (including life imprisonment) was high at 48.1% when compared with that of all new inmates (41.8%) (Source: Annual Report of Statistics on Correction). Amongst the new inmates associated with Boryokudan in 2009 those who were imprisoned for the “first time” were the highest in proportion at 21.9%, followed by those imprisoned “twice” at 20.9%, “three times” at 16.3%, “four times” at 11.6%, and then “five times” at 8.0%. The proportion of those who has been imprisoned “six to nine times” was 17.3% and “10 times or more” 4.0%. 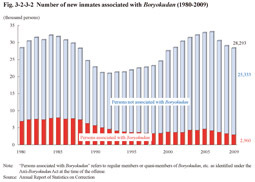 The proportion of those imprisoned twice or more was higher among those associated with Boryokudan at 78.1% than all new inmates at 54.8% (Source: Annual Report of Statistics on Correction).